Las Vegas is known for its countless attractions and the bright lights and glamour of its 24-hour entertainment and gambling culture. But what are the highlights that the typical visitor might not know about both on and off the strip? Don’t miss heading downtown to see the original, historic neighbourhood of Las Vegas. This once seedy area is where you will find the older parts of the city with retro signs and more affordable hotels and casinos along Fremont Street, which is being redeveloped but still retains an authentic charm. This urge to preserve the unique history and culture of Vegas can be further seen at the must-visit Neon Boneyard, an outdoor museum of Las Vegas signs from the 1930s onwards. These extraordinary historical artefacts were left to fall apart until the museum began to catalogue and restore the signs. Booking is essential to visit but it is well worth it to learn about the history of Vegas, the colourful people who made the city what it is, and the evolution of designs and illumination technology. For those who like a little adventure along with their stunning scenery, Nevada and Arizona have plenty of options within a 45-minute drive from the strip. Flightlinez operate in Bootleg Canyon with short hikes and exhilarating aerial trails. The guides are entertaining, regaling you with banter as well the history of the area. They are also on hand if you end up stranded on the wire like one of our party. He was pulled to safety while being serenaded with Hero at the same time! Likewise Danny Latham, owner and guide at Vegas Glass Kayaks is equally entertaining and knowledgeable. A former film actor, his knowledge and passion for the environment and local history shines through. Floating along the crystal-clear Colorado River in the sunshine and seeing the Emerald Caves was a languid, peaceful experience. We were lucky enough to see a bald eagle and some mountain sheep, and felt a world away from the hectic city. 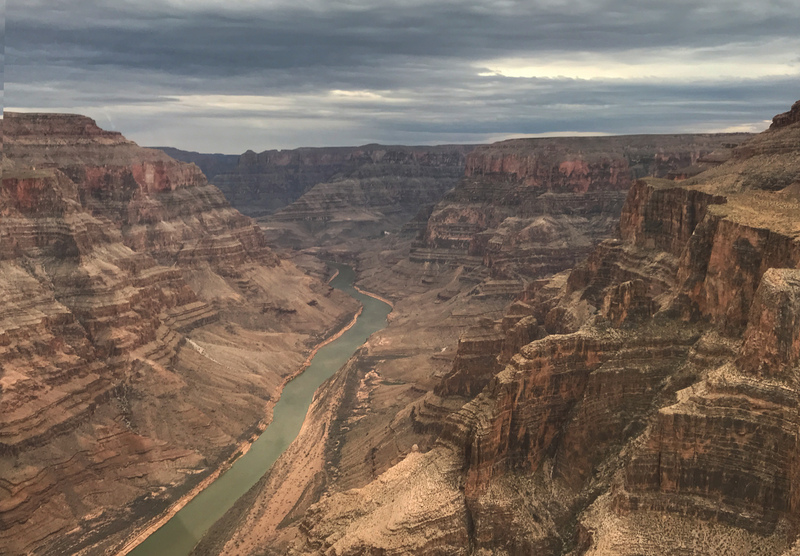 If you want to see the surrounding landscape with added Vegas drama, it’s hard to beat the Sundance Helicopters tour of the Grand Canyon. An early trip is recommended to catch the sunrise over the breath-taking views. The two-hour trip flies over the Hoover Dam and lands on a ledge in the Canyon overlooking the Colorado River, where the pilot served us a champagne breakfast while we took in the views. The dramatic descent into the Canyon and over the desert really is unforgettable. For relaxation and recovery from the frantic pace of the strip Canyon Ranch Spa Club at the Venetian is the world’s largest spa - offering an escape from it all with the Aquavana thermal experience, with warm and jovial service in a luxurious environment. For relaxation, Vegas style, the spa at the Mirage also offers yoga with dolphins - a once in a lifetime experience to take part in a class in an aquarium with the dolphins swimming around you - and in my case possibly laughing at my attempts. There are many opportunities for retail therapy on the strip but for those looking to grab a bargain Simon Las Vegas North Shopping Outlet offers well-known brands at discount prices. Just remember the tax is not added to the price label! As for food, highlights included the lip-smacking foodie tour Savoury Bites and Neon Lights - not only a lot of fun but a solution to the perennial indecision over where to eat, as you get to try dishes at four top restaurants. The guide also points out pieces of public art and curios and tells stories to engage you with things that you wouldn’t normally notice as you walk around, giving tips about hidden speakeasies and off-menu cocktails. One of the best aspects about this, aside from the world class food on offer, was the elevated bespoke experience: instead of feeling like second class citizens, the tour tables were ready on arrival, the chef greets you and service is impeccable. It even ends with a nighttime helicopter ride over the strip - for the ultimate VIP end to the evening. Beerhaus is also recommended for those wanting local craft beers and barbeque food - the slow cooked brisket, chicken wings and bratwursts were all delicious. Of course for those who want the experience of traditional Las Vegas there is an overwhelming amount on offer – miles and miles of casinos, bars, theatres and other delights. But the city has so much more to it and works as an all-round destination in its own right. Unfairly maligned for being artificial and lacking soul, for those visitors who take the time to explore off the strip there are many unexpected and unforgettable things to experience that form a part of this one-of-a-kind city. The Las Vegas Convention & Visitors Authority is charged with marketing Southern Nevada as a tourism and convention destination worldwide, and also with operating the Las Vegas Convention Centre and Cashman Centre. 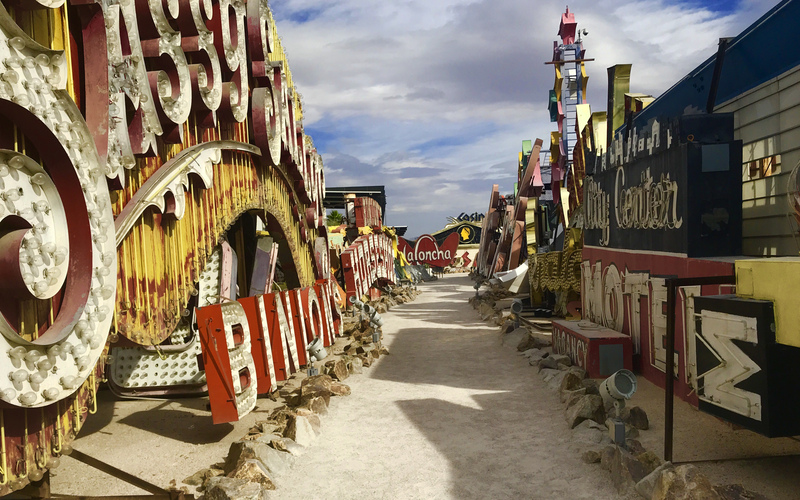 Find out more about visiting Las Vegas on the official website, or take a look here as Sapphire Goss explores how the city remembers its roots as it constantly seeks to reinvent itself.